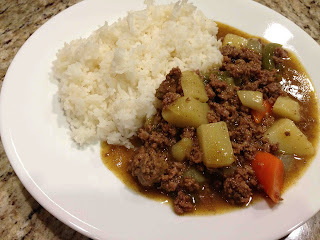 Hubby loves Japanese curry though. Same with soon-to-be-bro-in-law, so it's definitely one of the things I'll have as backup on those nights when I have no clue what to make for dinner. And now that my sis and her other half live so close, I typically make dinner for them too (for now anyway until they settle down). (Optional) Heat oil in a large pot on medium high heat. If using a large Dutch oven, skip oil. Brown ground beef until cooked in a large pot/Dutch oven. Stir in remaining ingredients. Bring to a boil then lower heat. Cover and simmer for 20 minutes or until potatoes are tender. (Optional) Turn off heat and stir in peas. Serve over rice and maybe some condiments (eg., pickled ginger, oshinko, etc. ).